The era of Yankee Stadium — the old one, with the ugly columns in upper deck and frustrating sightlines — ends Sunday night, with a nationally televised but meaningless game against the Baltimore Orioles. (It’s Andy Pettitte versus Chris Waters, so set your TiVos.) This is the first time the Yankees have not made the postseason since 1994 — when there was no postseason. What went wrong? The temptation is to say everything, but that’s only true if you look at it as a Yankees fan. After all, the team will finish above .500, and the Pittsburgh Pirates haven’t done that in sixteen years. But if you’re looking for places to assign blame, here are five candidates. The pitching is both too young and too old. One could make the argument that the Yankees’ season really ended when Chien-Ming Wang tore a ligament in his right foot while running the bases during an inter-league game in June. (It inspired Hank Steinbrenner to lament the DH, which I assume he’s been doing every day for the last 35 years.) This, combined with Phil Hughes’ struggles (his rib is hurt! He’s nearsighted!) and Ian Kennedy’s implosion, left the Yankees with two reliable starters, both of whom were over the age of 36. And that’s not even accounting for the ongoing Joba Chamberlain experiment. Hughes still has a ton of potential, but he’s gonna be a lot more work than many Yankees fans were anticipating. The rising stars started falling. Hughes’ and Kennedy’s woes might have been anticipated, but what happened to Robinson Cano was not. The Yankees signed Cano to a four-year, $30 million contract, which made sense; they wrapped up a guy who was coming off two consecutive .300 seasons. (In 2006, he even made the All-Star team.) Even allotting for a bit of a comedown, you wouldn't have expected the sloppy, slumpy season Cano has had. And Melky Cabrera officially established himself as a non-prospect this season — someone the Yanks probably should have traded while they had the chance. Derek! 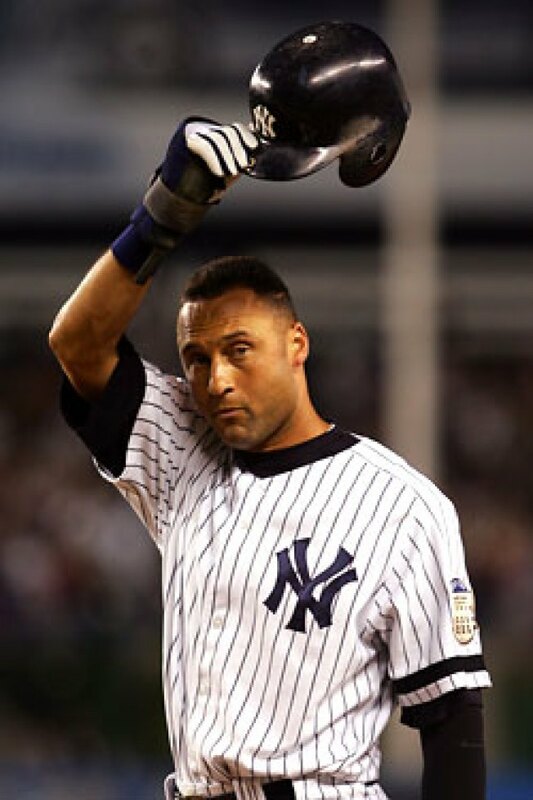 Jeter! It hardly seems fair to dump on Mr. November, the one constant the team has, but Jeter has had his worst season in a decade. He has come on a bit in the last month or so, and he’s hardly in danger of losing his job, but not even his most passionate fans can excuse his defensive liabilities anymore, and he was never able to carry the team anyway. At 34, he has clearly entered his decline. Will we see him at first base in a couple of years? Carl Pavano is still here. Pavano pitched a few games this year and wasn’t even that horrible. That’s something. Unfortunately, it came at the end of a four-year, $39.95 million contract. If you’re doing the math, that’s $1.598 million per game. Pavano didn’t hurt the Yankees any more this year than he has other years, but the decisions to sign him and trade away prospects over the last five years have added up. That is to say: This is the category in which we toss in Brian Cashman and the Steinbrenner family. As Chris Smith pointed out in the magazine a couple of weeks ago, the Yankees haven’t quite figured out their front office; Cashman’s status is still dangling. Cashman’s also responsible for overrating prospects like Cabrera, Cano, and Kennedy. The player-development arm isn’t close to the level of that of the hated Red Sox. (There are bright spots in Austin Jackson and Brett Gardner. But still.) It’s a team in need of both an overhaul and a quick fix. That spelled trouble before the season, and it spells trouble now. Mr. Ciccone. Once again, Alex Rodriguez has had a perfectly serviceable year. He leads the American League in slugging percentage, he’s in the top ten in RBIs, and actually has a chance at the AL home-run title. But if you’ve been to Yankee Stadium over the last month, you’ve heard what fans in the Bronx think about those stats. A-Rod’s re-signing with the Yankees over the off-season was a panic move on the part of both parties; it didn’t eradicate A-Rod’s trouble hitting with runners in scoring position, his aloof, tone-deaf interaction with fans, or his creepy overeagerness. As long the Yankees keep failing to win World Series, A-Rod, unfairly, is going to be the target of ire. And needless to say, that’s not going to make matters easier for him. The situation is not destined to end well … and then there's the next nine years. Something needs to change, and it’s hard to imagine A-Rod suddenly turning over a new leaf. The thing with these five problems is that they’re not going away. The team has to figure out if it’s going to re-sign Jason Giambi, Andy Pettitte, Mike Mussina, Bobby Abreu … you name it. And who knows who will be in the rotation. Joba Chamberlain might be … or he might not be. Maybe they’ll sign CC Sabathia, but he’ll be asking for around $20 million a season, and he still won’t address the underlying issues. The Yankees, friends, are a mess. C – Posada (if healthy). So many question marks. And that’s not even mentioning the rotation. The question isn’t, What went wrong with the Yankees this year? It’s, What’s gonna go wrong next year?